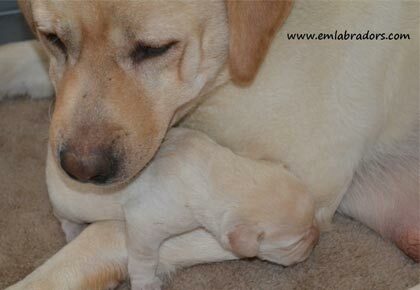 We often have people inquire about adding puppies to their lives while they still have an older lab at home. 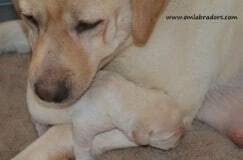 More often than not, people are afraid that their old lab will feel replaced, cheated on, and betrayed if they bring home a young pup. I have to say, in my own experience, there is nothing farther from the truth than that. Especially with labs. First of all, as I’ve said in other posts, dogs are pack animals. They ALWAYS do better with a canine companion. And most often people are amazed when they bring home a puppy and it really brings out the life in their older dog. 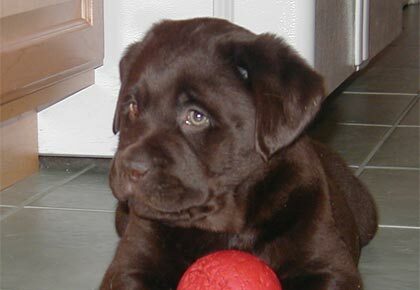 I’ve seen old labs play like puppies when encountering a younger dog. If you’ve ever seen that, you know there’s no better feeling in the world! 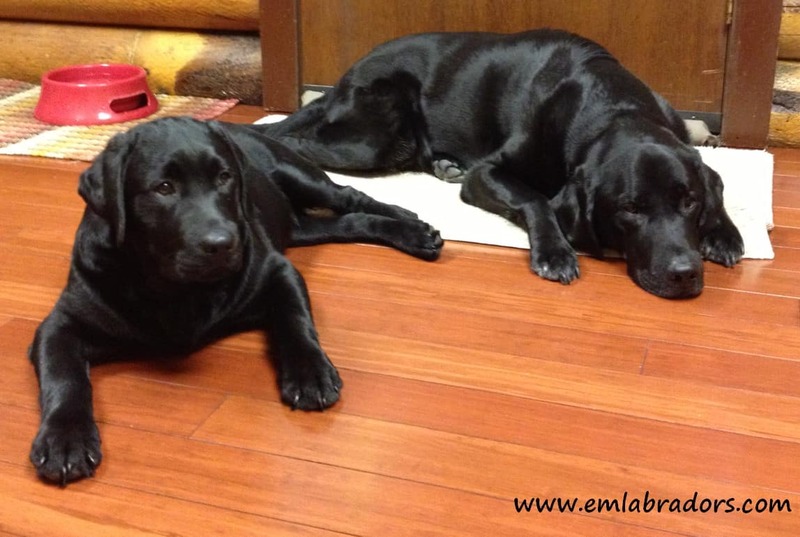 The picture above is of Endless Mt.’s Chip off the Ole Doc (“Chip”), a Doc puppy, and his buddy Amos. They live together in Alaska with their human mom, Karen. 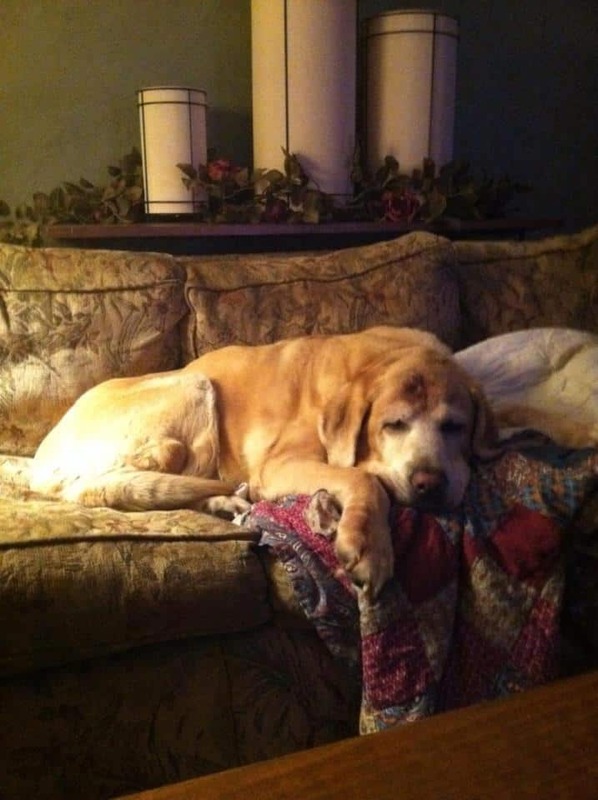 Amos is an older boy and was diagnosed with cancer last year. Karen brought home Chip in hopes to brighten Amos’ life a bit, and he did just that! They are now absolute buddies who play and lounge together. She couldn’t be happier with her decision! One thing we do recommend for older labs is a supplement called NuJoint! You probably read about NuVet under our Dog Nutrition page already (https://emlabradors.com/nuvet-supplement/). We often have clients ask about NuJoint while ordering NuVet for their new puppy because they may have another older dog at home. This is a great supplement for older dogs or for any dog with joint issues. It has glucosamine and chondroitin in it to help improve hips and joints. Well said – my old Lab is sleeping while I write and stinks with the wet dog smell only an owner can appreciate! No matter how old and crippled up he gets – he heads for the river or lake every-morning when we go to feed the horses. Mojo is always happy always ready for anything and never gets left home! He would not stand for it! He spends more time in the back of my old 69 Jeep looking out on alfalfa, winter wheat, or trails…nothing better than old Lab! Mojo sounds like he’s living the life! 🙂 Thanks for sharing Hoss! As I come home from a long day from work. I am greeted by my man CODY!! Smiling as always, wagging his tail and kissing me as if I been gone for days. It warms my heart as always. I kick off my shoes relax a bit and check my Facebook. I come across a picture of my dog. Wow, he is so handsome. I begin to read all the comments. Tears stream down my face. I truly love my dog!!! Then I come across the headline post and I’m now crying ! 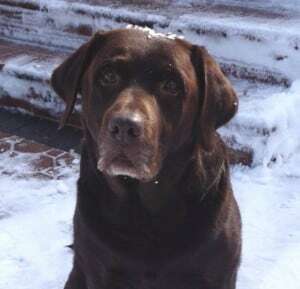 My chocolate lab has given me and my family so much more than I can even put into words. Cody has been by my side through it all! 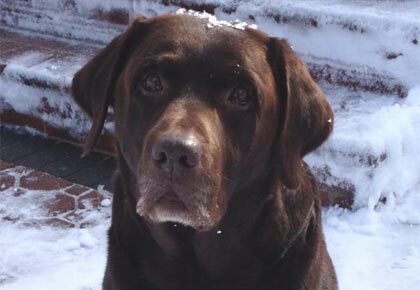 Life is so much better when you have a BEST FRIEND….. A CHOCOLATE LAB !!! And now you’re making me cry! Tina we just love Cody! It’s so crazy for us to see an old Doc pup… Cody must have been from Doc’s first litter. It’s what inspired me to write this post. Love his gray chin and broad Doc like head. 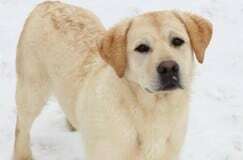 My Maggie is a 9 1/2 year old yellow lab. I can’t say enough about how much she has complemented my life as a faithful companion. She’s recently developed arthritis in one of her shoulders. She took a bad fall on the stairs and sprained the shoulder so now I think the time has come when I can no longer allow her upstairs. I miss having her on my bed at night SO MUCH! So much that I will peridodically sleep on the couch downstairs so I can have her next to me. She is loved beyond loved. I hope and pray that she will be with me for several more years to come! Hope Maggie is doing a bit better! 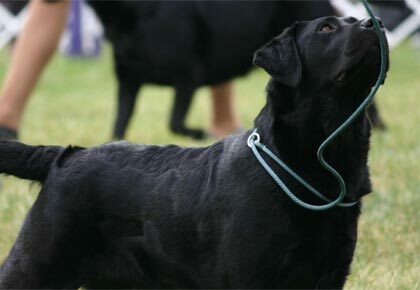 🙁 There’s really nothing else like owning a good lab… once we’re spoiled with one, there’s no getting used to being without one! I read this post and just had to reply. The whole journey from rambunctious puppy to mature dignified adult is a journey I wouldn’t give up for the world. We picked up our chocolate lab at the perfect age of 8 weeks. A 61/2 pound ball of fur, who slept between my two kids on the 8 hour journey home. It was absolutely amazing how this dog, ingrained herself into almost every facet of our life. I look through pictures of birthday parties, holidays, and any kind of function at our house, or another dog friendly house, and there she is. Right in the middle of her people. That’s just how she was. Always around the people who loved her and so willing to give that love right back. Unfortunately, we had to put her down on Sunday. Perhaps the hardest day of my whole life. She went from being fine to sicker than she deserved to be. Ultimately, the choice to save her from any kind of suffering outweighed my illogical choice to want her to keep fighting. Someone earlier asked how do you know when it’s time. You will know. It will be the most gut wrenching emotional decision you will have to make. But the only person who knows your dog is you. We were very lucky in the emergency vet we were dealing with. They gave us the best information and always, always had our dogs best interest at heart. Ultimately, there was nothing for us to do. There was no magic treatment that was going to help her. I miss my dog more than I ever thought I would. The daily reminders are the toughest things. The everyday habits that you take for granted. The little things that remind you of her such as toys laying around or the thing that catches your eye and makes you think she’s walking in the room. Sorry to ramble but in closing, it’s an amazing journey you take with your dog. Something special. With a special dog. Love you pup. Beautiful, Tim… Thank you for taking the time to share this. Thank you for letting me share. It’s all still very surreal. We just started putting Abby things away and it’s a hard process. This allowed me to vent a little. Nice to have a common bond with complete strangers who understand where I am coming from. Tim, I know all too well that stage of grief you are going thru. My Ranger is possibly in his last weeks. I’m waiting for him to tell me when he’s had enough. When my last lab, Buck, passed a good friend sent me a leather bound box with a place for a photo on the top. It was to keep Buck’s momentoes in. It helped me to gather up things that reminded me of different times/adventures we had had over the years. It helped and I put it in a special place. Maybe something like this could help you. Thank you for the suggestion. That is a great idea. There was obviously some stuff we weren’t going to keep but there were a few definite things we just couldn’t get rid of. Thanks again for all the support. It’s gotten a little easier but I still have the hard days. Ad just to update, we have taken the plunge again. 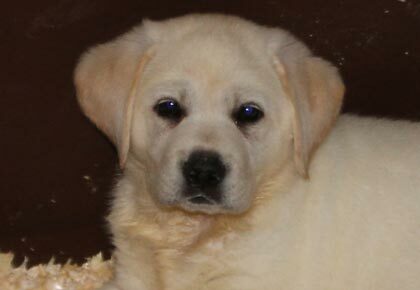 We will be bringing home our new pup in just two short weeks. A very handsome chubby black lab that we are going to name Oliver. Going from adult sophisticated mature lab to all out home wrecker puppy is going to be a challenge but I think we’re up for it. Thanks again to everyone. Tim, like you I had to make the same decission in July, with my 14 year old retriever Pepper. No one will ever replace her but we are about to start the journey again and I’m looking forward to every moment. I’m so sorry to here about your retriever Pepper. I’m sure It wasn’t an easy decision. You know how it is though, we do what’s best for our furry kids. I glad to hear about the new addition to your family though. I wish you the best of luck with your new pup. 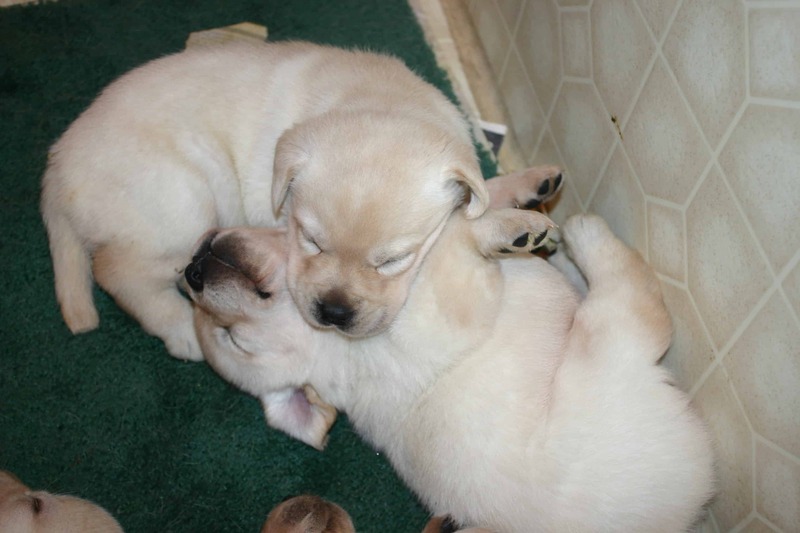 We, too, decided to get another lab. He’ll be coming home in two weeks and we can’t wait. Our house has been too empty. Good luck and thanks for the comments.